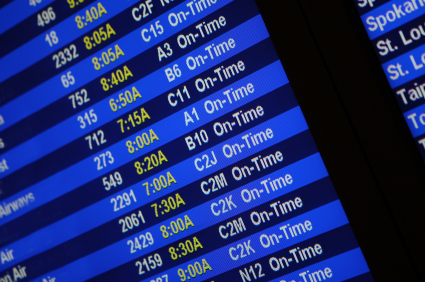 Airline Schedule Padding: Good or Bad? The Wall Street Journal‘s Scott McCartney posted a pretty fascinating column last week, detailing exactly how much extra time has been added to airline schedules over the past decade-and-a-half. It’s worth reading in full, but here are the highlights for the purposes of our discussion. Overall, McCartney checked 50 major U.S. routes across nine airlines, and found that flights were “17 minutes, or 10 percent, longer in airline schedules for this March compared to March 1996 schedules.” Of course, none of these cities are further apart than they were three or even 15 years ago. The delays are largely the result of congestion on the ground and an increasingly overwhelmed air traffic control system, although slower cruising speeds (to save fuel) and an increase in the use of slower regional jets both play a part. From a consumer’s perspective, this creates a paradox: Even the most on-time airlines aren’t necessarily on time. Which is to say, their flights could take longer than they should, but you wouldn’t necessarily be able to tell by looking at your schedule. And as McCartney points out, padding route times helps improve those coveted on-time rankings monitored by the Department of Transportation (DOT), creating a false perception among the traveling public. Of course, you may not care. The flip side to the issue—which the airlines are quick to point out—is that padding schedules results in more realistic expectations for passengers. After all, what does “on time” really mean? It means you get there when you’re supposed to. And if airport congestion is so bad that it affects this, shouldn’t that extra time be included in your itinerary? I will leave you with this question: What do you think? Are the airlines cheating the system, and deluding their customers (and the DOT) with a false sense of punctuality? Or does schedule padding actually benefit travelers by providing a more honest sense of how long a trip will take? Leave a comment below with your thoughts.